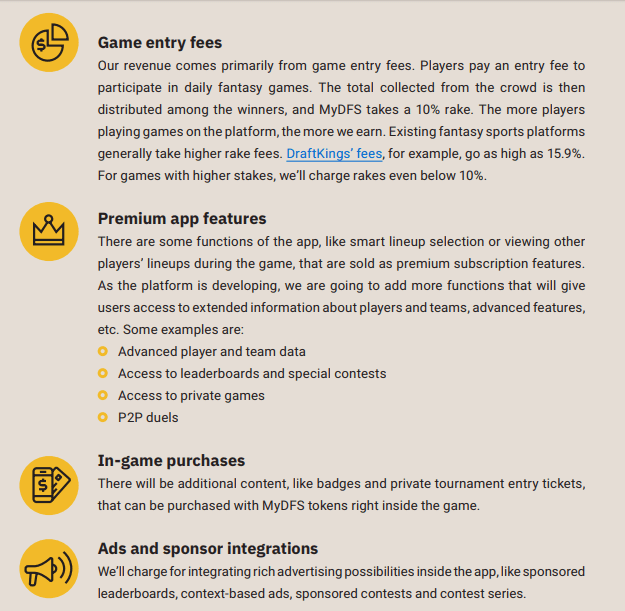 MyDFS is a blockchain-based daily fantasy sports solution that connects sports fans around the world with a transparent, easy-to-use, investorfriendly platform. 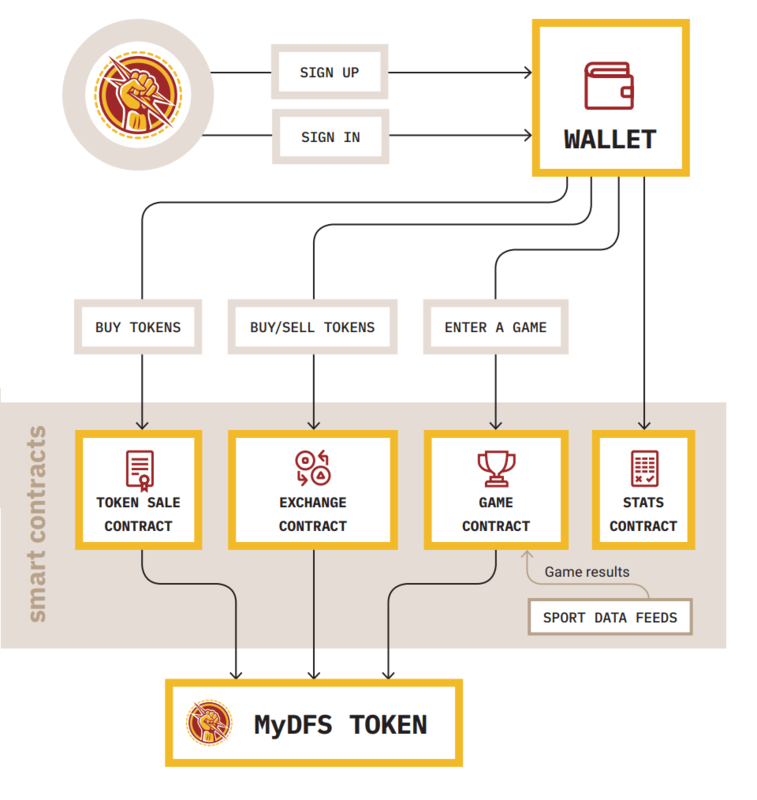 MyDFS adds maximum transparency by using the blockchain and smart contracts for every part of the platform, from player trades to receiving your winnings. Fantasy sports is a very rapidly growing part of the electronic sports and entertainment market. It grew almost five times in one decade. Starting with 12.6 million players in 2005, it approached 60 million in 2017, and that’s just in the US and Canada. As of June 2017, the fantasy sports industry’s market capitalization was more than $7 billion, with an average spending of $556 per player per year2. The market in the US is dominated by two main competitors, FanDuel and DraftKings, which share almost 90% of the entire market, followed by smaller players like Yahoo Fantasy. The market is way less saturated for Europe and other parts of the world because FanDuel and DraftKings are just starting their expansion. There is no real front-runner among other companies like Oulala, or a number of fantasy sports platforms run by major newspapers and sport leagues (Premier League Fantasy, Daily Mail Online Fantasy Football, and so on). Modern fantasy sports are dominated by daily fantasy — a game that sees users play a shortened, highly accelerated version of the game that might last from a day or two to one week. Since it doesn’t require much time to play, it brings more players in and they get their results almost instantly. Another noticeable trend is that most players are starting to use mobile apps to play fantasy sports, not their desktop computers. Even if the market is quite competitive, the major offerings have old, complicated apps that aren’t easy to get acquainted with, and are hard for a new player to master. The platform as a whole, including the mobile app, backend services, smart contracts, and so on. Users sign up with their existing Ethereum wallets, which we’ll link their game tokens to via QRcode, or by entering the address of their wallet, and then going through the wallet authentication procedure. The sign-in process stores authentication data locally so users don’t have to repeat the procedure every time they open the app. This is a ERC-20-compatible Ethereum wallet that can hold user tokens and move them throughout the app. The tokens available to the user are stored in a smart contract. Users can buy and sell their tokens using the app, which connects to Token Sale and Exchange smart contracts that store token data and transaction histories. A smart contract that lets users buy tokens during the pre-sale and sale periods. A smart contract that connects users with exchanges and lets them exchange tokens for other cryptocurrencies, buy more tokens for other cryptocurrencies, and so on. A smart contract that records user statistics. It can be used by every member of the blockchain to validate all transactions. It’s also used by other smart contracts, like a game contract, to get or store the data needed to calculate game results. Additionally, a brokerage contract can use the statistics to help brokers choose the right player to invest in, and monitor their performance. A smart contract that records game data, player lineups, all in-game actions, and calculates the results of the game. Outlined in chapter 4.3, third-party providers build data feeds that enable this platform to work. These feeds contain the real data from games held by major sport leagues, and we use it to calculate a virtual team’s in-game performance. 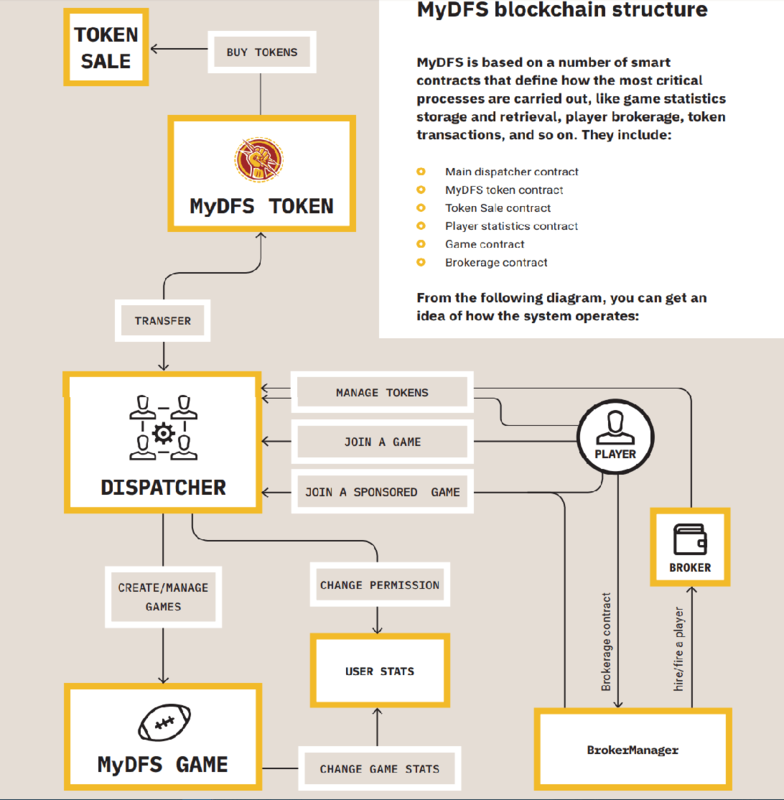 MyDFS token An Ethereum-based token we use for any value transactions on our system. Pre-ICO finishes. Soft launch of MyDFS app in several countries. Intensive public marketing & PR campaign starts. ICO starts. The app is fully ready for the biggest soccer championship.